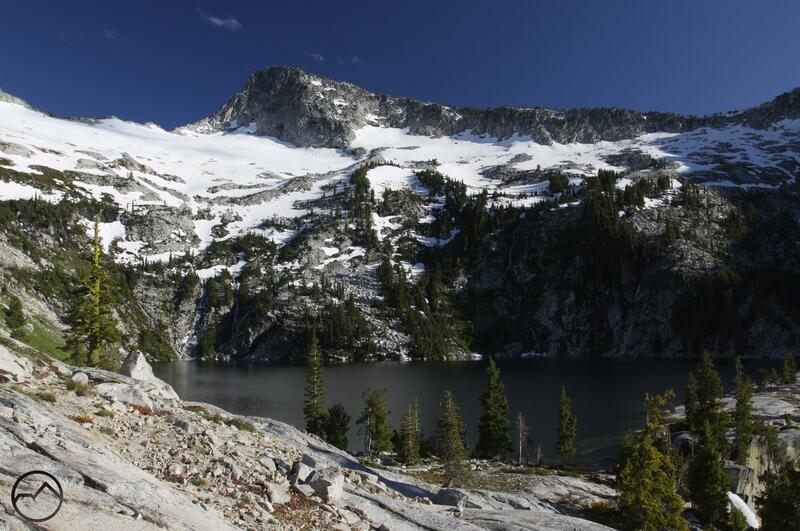 The grandeur of the Klamath Mountains can be seen at Diamond Lake in the Trinity Alps. This is a continuation of the the article examining California’s magnificent Klamath Mountains. Part I can be found here. This took an overview approach to the whole range and looked at the wildlands that are scattered throughout it. The Klamath Mountains are vast and it is much easier to appreciate the range by examining the various subranges in order to get a better idea of just how diverse and magnificent these mountains are. This article will break the range down by its numerous subranges and note some of the characteristics of each. It will only address the California portion of the Klamaths. The Oregon portion, notably the Siskiyous, the Kalmiopsis Wilderness and lower Rogue River area are outside the scope of this article and are best treated as a separate entity (and subject of a later article). 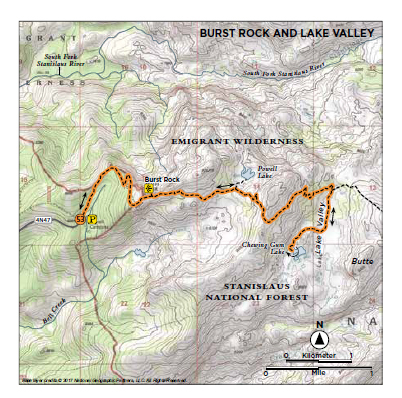 *Note that this map is only approximate and does not accurately represent the precise limits of each subrange of the Klamath Mountains. Occupying the northern section of the Yolla Bolly-Middle Eel Wilderness, the North Yolla Bolly Mountains are an isolate block of high elevation peaks. The North Yolla Bollys lies right on the transition zone between the Klamath Mountains and the North Coast Range. Geologically they are an island of metavolcanic rock surrounded by sedimentary and ulrtramafic rocks. Though they are distinct from the rock types of both the Coast Range and the Klamaths, their position within the latter range is secured by the presence of the South Fork of the Trinity River. This river’s headwaters lie immediately north and south of the North Yolla Bollies and then flows to the northwest for 92 miles before joining the Trinity River. The North Yolla Bollys consist of a long ridge that towers over the surrounding mountains. The ridge is capped by the high peaks of North Yolla Bolly and Black Rock Mountain. These are the second highest points in the Yolla Bollys, after South Yolla Bolly, the highest point in the North Coast Range. Each of the two high peaks in the North Yolla Bollys host a single, small lake in north facing cirques. Along with the mountain summits, these are the most popular destinations in the range. 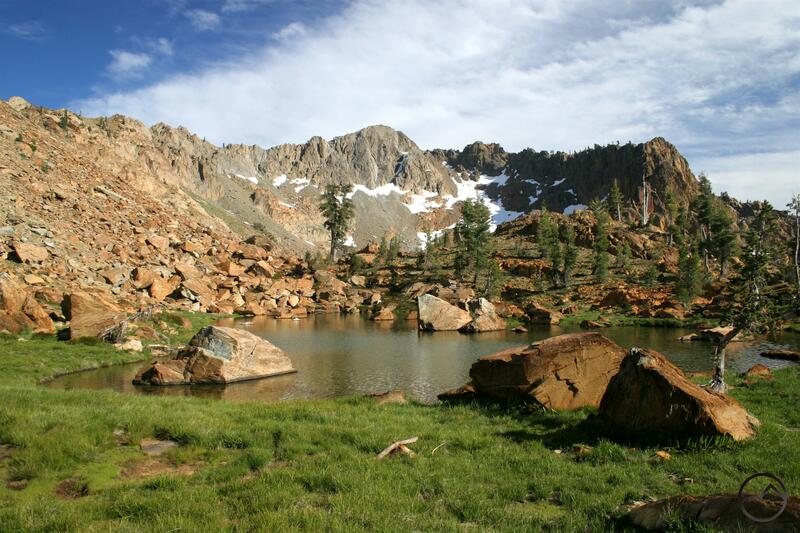 Most of the North Yolla Bollys are protected in the Yolla Bolly-Middle Eel Wilderness. Part of the freshmen class of wilderness areas established by the 1964 Wilderness Act, it is one of the least visited wild areas in California. Despite this, there is a well-developed trail network that accesses both the north side of the range and the wilderness’ remote interior. The trail passes through Petijohn Basin, with spurs leading to the small lakes and mountain summits before penetrating into the wildlands further south. Inside the Massacre Natural Bridge. Lying between the North Yolla Bollys and the main fork of the Trinity River is a large block of low to mid-elevation mountains. 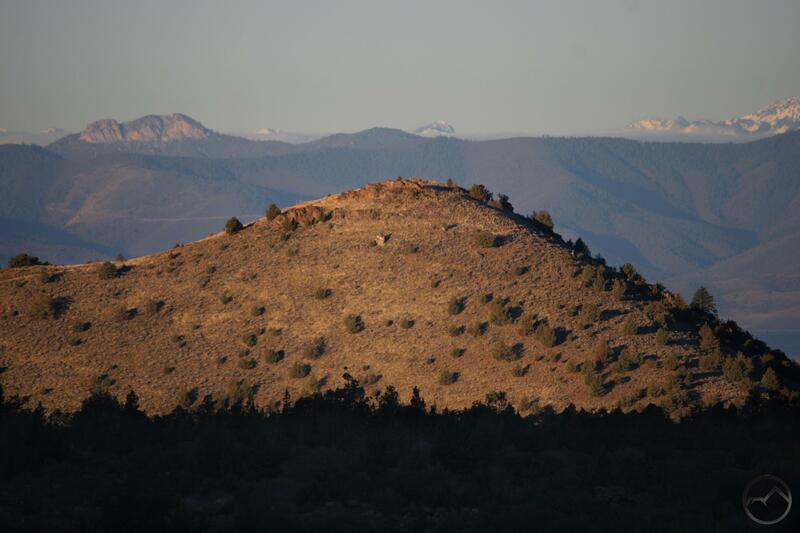 This area is covered with expansive forests and vast swaths of chaparral. There is no formal distinction for this region but its size demands its inclusion here. Drained by the South Fork of the Trinity River and Hayfork Creek on the west and Cottonwood Creek on the west, this area is the generally the lowest elevation region in the Klamath Mountains. The only significant upland area rises on the east side. Here, a ridge dotted with tall peaks climbs to elevations over 6,000 feet. The highest point, Bully Choop, stops just short of 7,000 feet. Two other notable peaks are part of this long ridge. Anchoring the western end is Chanchelulla Peak, protected by the tiny Chanchelulla Wilderness. At the eastern end is Shasta Bally, which is prominently visible from Redding. This peak is the highest point in Whiskeytown National Recreation Area. This park is the most well-developed area in terms of recreational amenities and attracts the most attention from hikers. Few other destinations are present in this part of the Klamath Mountains, the most worthwhile of which is the fascinating Massacre Natural Bridge, which is home to a short trail and loads of interesting geology. Some maps identify this area as part of the Trinity Mountains. This seems like an unnecessary confusion. The Trinity Mountains lie further north, on the other side of Highway 299. The ranges are quite distinct from each other. The Shasta Bally/Bully Choop ridge is part of a granite batholith and forms the divide between the Trinity River and Cottonwood Creek. On the other hand, the Trinity Mountains are composed of sedimentary rocks and form part of the divide between the Trinity and Sacramento Rivers. Another one of the little known set of mountains within the Klamath Mountains, the Trinity Mountains are a collection of mid-elevation ridges and peaks that form the divide between the Trinity River and the Sacramento River. Blanketed by dense forest and some forbidding chaparral, the mountains here are generally sedimentary in nature. 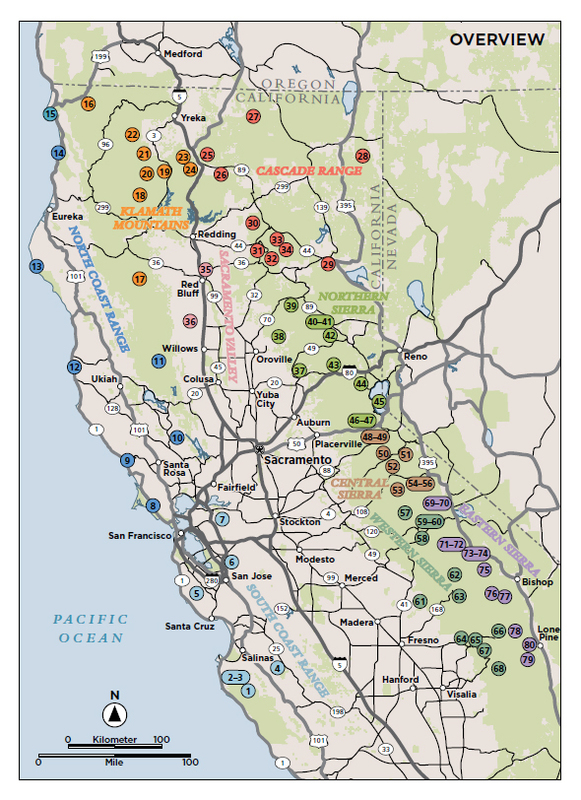 Though the Trinity Mountains forms the southern half of the divide between the Trinity and Sacramento Rivers, it also produces a significant watershed of its own. Clear Creek rises at the north end of the range and flows south for over 40 miles before it joins the North Fork of Cottonwood Creek. Clear Creek is impounded to form Whiskeytown Lake. The Trinity Mountains are one of the least developed parts of the Klamaths in terms of recreational infrastructure. There are no trails and only a lone, primitive campground near the headwaters of Clear Creek offers any sort of amenities. McCloud River Canyon, the heart of the McCloud Range. East of the Sacramento River and Interstate 5 lies the most forgotten and anonymous part of the Klamath Mountains. Lacking a name or any other sort of designation, these mountains present a rugged, impenetrable visage to those who take an interest in them. Though there are no trails or campgrounds in this remote region, there is one major recreation attraction. Major sections of these mountains are composed of marine sediment and in many cases this manifests as large limestone peaks. 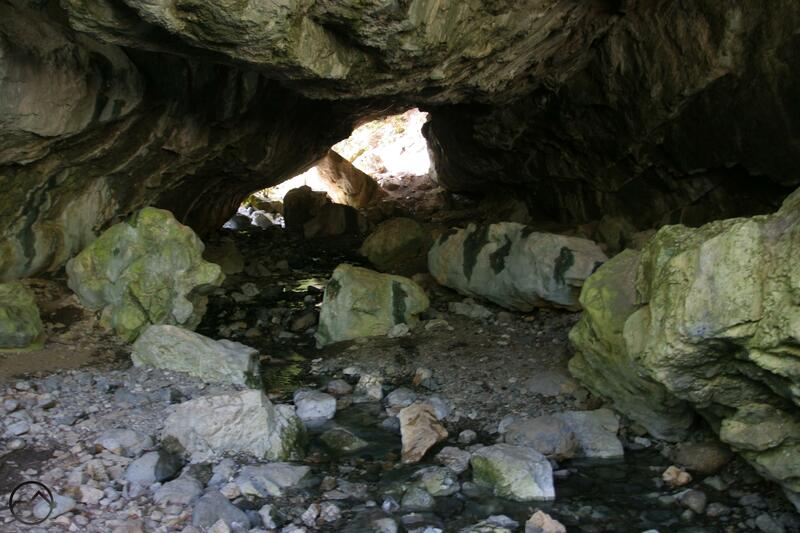 Typical of this kind of rock, caves have formed and the Shasta Caverns have become a popular destination. Though there are some major peaks, notably North Gray Rock (home of Shasta Caverns), Tombstone Mountain and Grizzly Peak, the most dominant feature in these mountains is the McCloud River. It rises far to the northeast but cleaves these mountains in two as it flows south toward the Pit River Arm of Shasta Lake. Its canyon is deep, narrow and remote. Though the range has no official name, the McCloud Mountains seems like a good choice, given its relationship to the river. Indeed, old maps from the 19th century identify these mountains accordingly, though the name never caught on. Despite being fairly unknown as a singular entity, the Trinity Divide is one of the most notable subranges of the Klamath Mountains. Its stature is ranked alongside the Trinity Alps, Salmon Mountains and Marble Mountains, the other tall, lake-filled subranges that make up the heart of Klamaths. The Trinity Divide has dozens of glacial lakes, large river valleys, high peaks and rugged terrain, just as those other mountain blocks do. What the Trinity Divide lacks is a large, federally recognized wilderness. It seems that without formal protections to alert hikers and backpackers, the Divide has kept just off the radar as a destination. Despite formal wilderness, much of this beautiful set of mountains retains its primeval character. Those very meager few who have entered Grey Rocks Basin at the head of the South Fork of Castle Creek or explored the small lakes atop the Castle Crags can attest to intact nature of the Trinity Divide’s wilderness. Mount Eddy peeks over the mighty Castle Crags. While there is not a large chunk of wildlands in the Trinity Divide, there is one small wilderness area. Though it is not large in area, in terms of scenic qualities, the Castle Crags Wilderness is a superlative destination. The obvious highlight is the mighty cluster of granite spire that make up the Castle Crags. 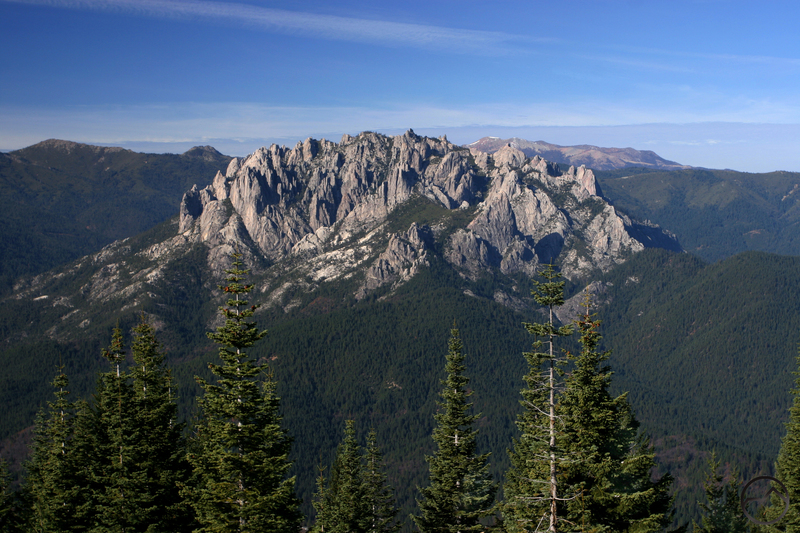 Unlike the rest of the Trinity Divide, the Castle Crags are moderately well known and have their own devoted following of fans. Despite not being well known like the Castle Crags, the Trinity Divide has other landmarks that continue to shine brightly. Among these excellent features is Mount Eddy, the highest peak in the entire Klamath Mountain Range. This large mountain is not as magnificent as nearby Mount Shasta but it remains a massive mountain in its own right and is home to several glacial lake basins. 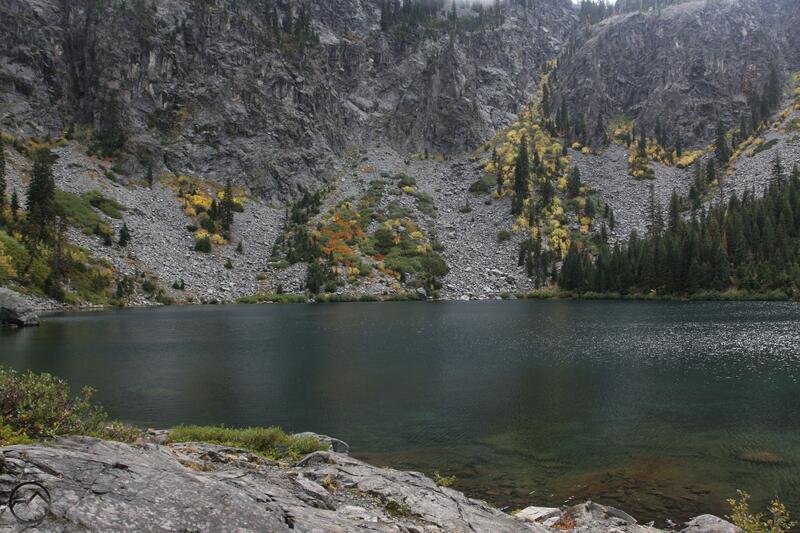 Among the other lakes in the Trinity Divide is Castle Lake, one of the largest in the Klamaths. The Trinity Divide is so named because it forms the divide between the headwaters of the Trinity and Sacramento Rivers. The Trinity is the largest of the rivers that rise in the Klamath Mountains and flow into the Klamath River. The Sacramento River is the longest and largest river in California. 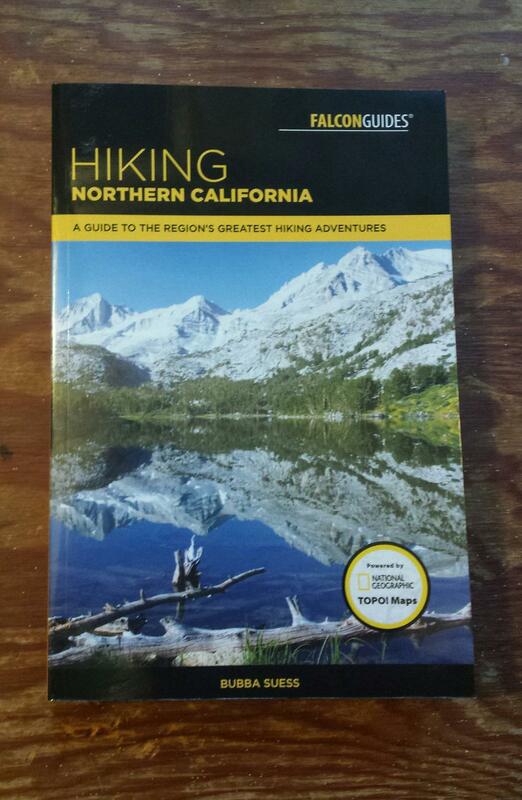 The Pacific Crest Trail follows the crest of the range, threading the needle between the waters that empty into the Pacific near amongst the North State redwoods and those waters that flow into San Francisco Bay. East Boulder Lake in the Scott Mountains. If the Trinity Divide is an obscure mountain range then the Scott Mountains are utterly forgotten. These beautiful mountains consist of a single long crest that runs for over 20 miles east to west. Much of the range is composed of reddish peridotite, giving it a distinct appearance. This rock is prominent in other parts of the Klamath Mountains but nowhere does it seem to be as ubiquitous as in the Scott Mountains. In many ways the Scotts seem like an extension of the Trinity Divide. The highest peak, China Mountain, is often considered the northernmost peak of the Divide rather than the most prominent summit of the Scott Mountains. Like the Trinity Divide, the Scott Mountains are named because they divide the headwaters of two rivers. The southern slope the range flows into the Trinity River. The northern slope is the headwaters of the Scott River, one of the major waterways of the Klamath Mountains. Several lakes are found in these mountains, many of which are accessed via a well-developed trail system. This is particularly true of the western half of the range, which is protected within the Trinity Alps Wilderness. The eastern half, with fewer (though there are still several notable lakes) and no wilderness protection, is a largely untapped resource for hikers. Worth noting, however, is Lover’s Leap, a set of crags which are home to a rapidly expanding rock climbing area. Grizzly Lake in the Trinity Alps. 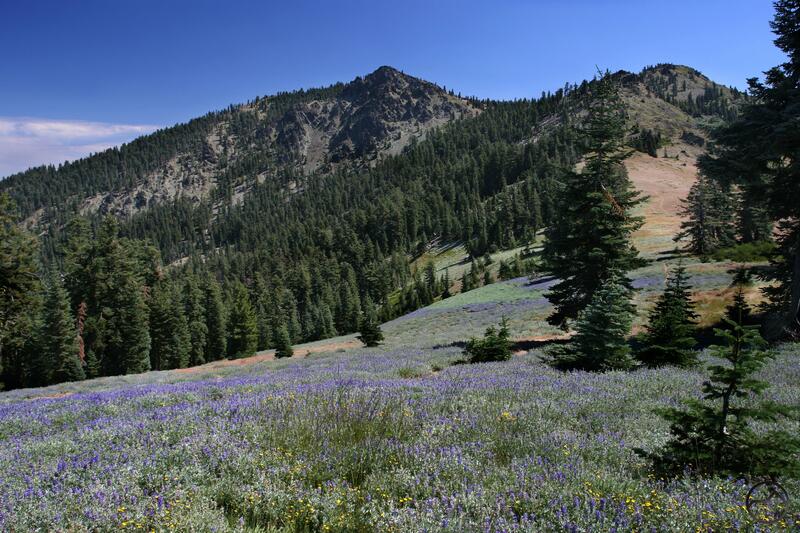 Although Mount Eddy may be the tallest point in the Klamath Mountains, the Trinity Alps are really the heart of the range. It is here that one finds the most expansive wilderness, the most spectacular mountains, the grandest scenery and the sense of limitless vastness that is a hallmark of the Klamath Mountains. 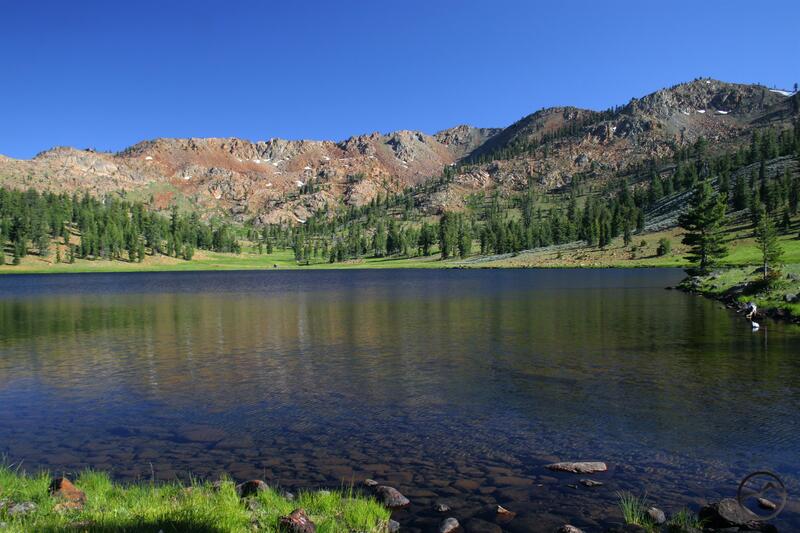 It is in the Trinity Alps that hikers will most readily find the stunning landscapes that make the Klamath Mountains such an incredible, mysterious jewel of the North State. Towering, jagged towers composed of granite and other, more exotic rocks abound here. Gorgeous alpine lakes are set like glittering jewels beneath tall cliffs. Thundering waterfalls hammer against dense rocks and vast expanses of lush, beautiful forests blanket deep canyons and a seemingly numberless set of tall ridges. This truly is the heart of the Klamaths. It is necessary to draw a distinction between the Trinity Alps Wilderness and the Trinity Alps as a subrange of the Klamath Mountains. The former is massive, totaling 560,000 acres. Its size is swelled by including portions of the adjacent Scott and Salmon Mountains. These sections of neighboring ranges lie on the divide between the Trinity River and the Salmon and Scott Rivers so are a natural fit within the wilderness area. Due to their inclusion in the large, protected wildlands, these sections are often thought of as part of the “Trinity Alps”, which is a natural, consequent association. The Trinity Alps proper, on the other hand, are somewhat smaller in area and lie wholly within the watershed of the Trinity River. For the purposes of this article, the sections of the Salmon and Scott Mountains that lie in the wilderness area have been separated out and addressed with their respective mountain ranges. Classic beauty of the Trinity Alps. 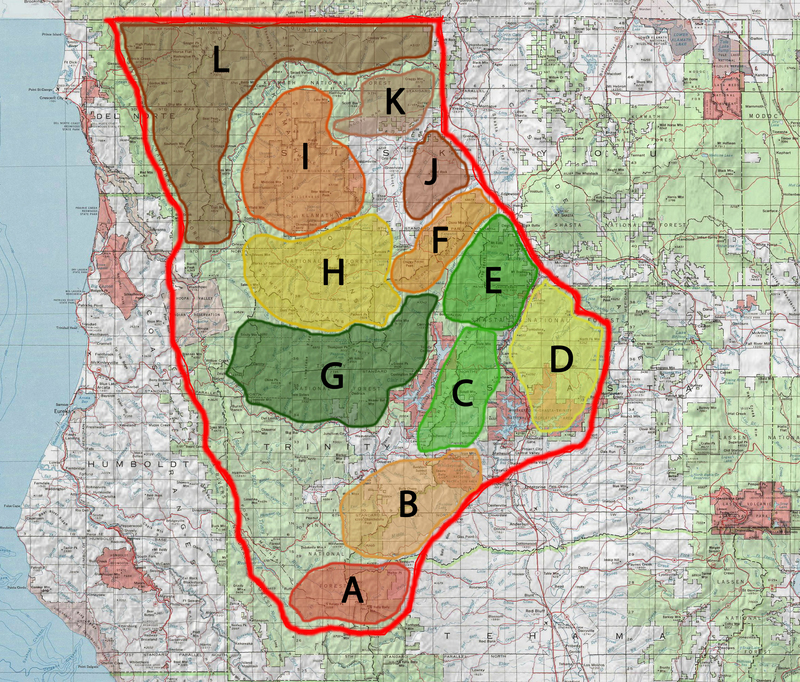 The Trinity Alps can be divided into three general areas. In the west, there is a vast expanse of forested ridges and deep canyons. Drained by the North Fork of the Trinity River and the New River, this area has a few small lakes and a scattering of rocky peaks that punctuate the sea of green trees. 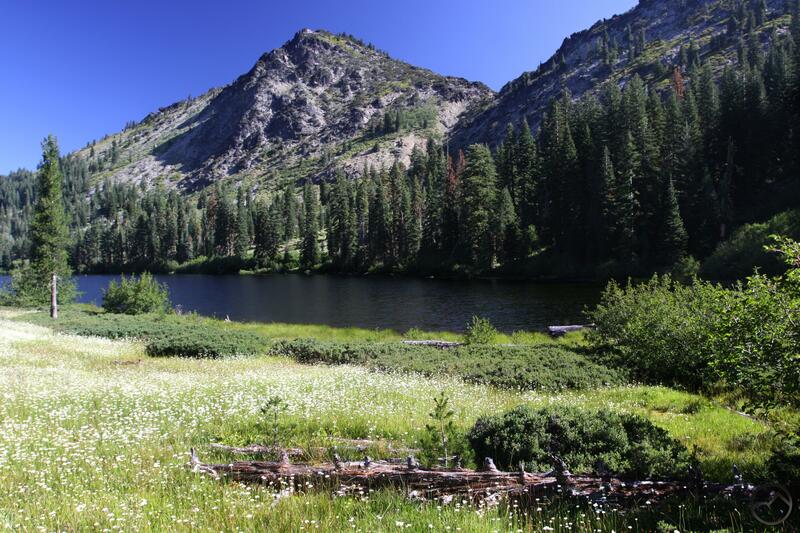 On the east side of the Trinity Alps, butting against the upper Trinity River, there is a collection of tall peaks, deep lakes and vast expanses of meadow. The peaks here are rugged, rocky and beautiful. Geologically, this area is a mixture of granite and red and yellow peridotite. It has a striking appearance. Sandwiched between these two areas is the epicenter of the Trinity Alps. Composed of stark white granite, this area has the highest peaks, most rugged terrain and largest lakes. This is the area that truly supplies the “Alps” moniker to the entire range. The entire range drains into the Trinity River. Some creeks flow west and join the river upstream from the impounded Trinity Lake while the rest flow south and join the river during its long journey west to join the Klamath River. Water is abundant within these mountains. The lakes and vast stretches of meadow feed the waterways well into summer and beyond. Several waterfalls, most notably in Canyon Creek and at Grizzly Lake, grace these mountains. Other smaller falls dot the area. Significant creeks include Canyon, Coffee, Swift, Deer, and Granite Creeks. Trails course through the Trinity Alps and it is possible to string together paths to create trips that would last weeks. 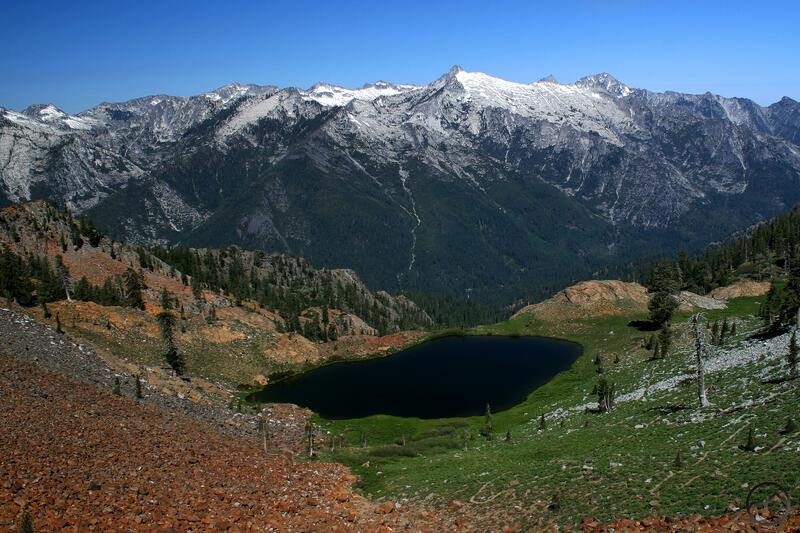 It is in the Trinity Alps that the great sense of remote expansiveness of the Klamath Mountains is most evident. Here hikers and backpackers can see for dozens of miles to the horizon knowing that civilization still lies even further away and the world around them is truly primitive. Taylor Lake in the Salmon Mountains. In some ways, the Salmon Mountains are the great lost range of the Klamath Mountains. This is not because they are utterly lost and forgotten, but because the administrative nature of the national forest has broken up the range’s cohesion. The Salmon Mountains are those parts of the Klamaths that are drained by the Salmon River (often called the Cal Salmon, to distinguish it from the magnificent Salmon River in Idaho, the famed “River of No Return”). Geologically, these mountains are fairly homogenous. However, the administration of these lands has led to something of a disassociation of the range. Specifically, it is the wilderness areas themselves that have led to the demise of the Salmon Mountains. The southern part of the range is included in the Trinity Alps Wilderness. The northern corner is joined with the Marble Mountains Wilderness. The high country at the east end of the Salmon Mountains is contained in the small but spectacular Russian Wilderness. The northern and southern parts are consequently thought of as parts of their adjacent ranges while the Russian Wilderness is left as an entity unto itself. Despite being broken up, these areas are thankfully preserved in their wild state and they are beautiful areas indeed. Granite towers, gorgeous lakes and lush meadows are found in these mountains, especially in the areas with the wilderness boundaries. Outside these protected areas, the range consists of lower, drier ridges that rise above the Salmon River. Trails are found throughout the area and hiking is easily the best way to experience this lost mountain range. 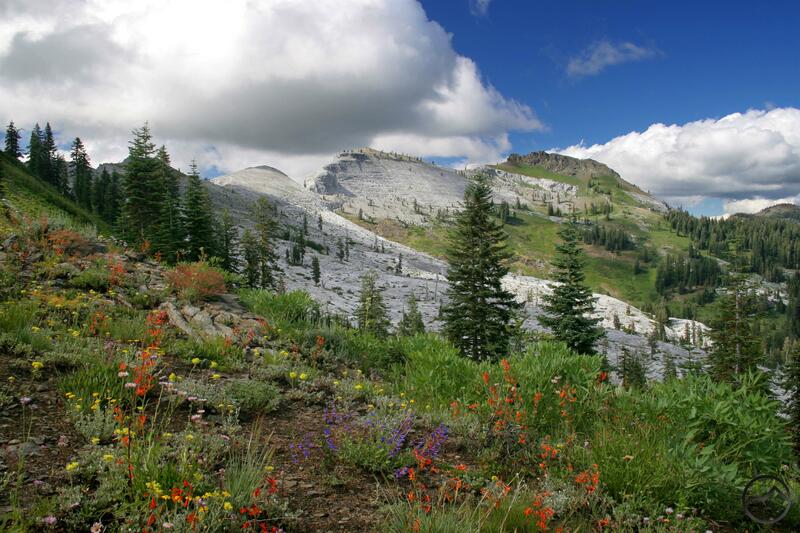 Wild and expansive, the Marble Mountains are second in stature only to the Trinity Alps. Like the Trinities, they offer a high concentration of the best of the Klamath Mountains, with a few unique twists of their own. Occupying the high country between the Salmon River and the Klamath River, the Marbles are protected within the 250,000 acre Marble Mountains Wilderness. Here there are dozens of lakes, towering summits and large, swift flowing creeks. Numerous meadows abound. Geologically, the Marbles are diverse. Granite plutons, especially around English Peak in the south and the Cuddihy Lakes in the north, are found on the outskirts of the Marble Mountains. The interior has classic Klamath Mountains geology consisting of peridotite and serpentine as well as sedimentary rocks. The crown jewel of the range, however, is the presence of large blocks of marble. The most notable are found on Marble Mountain itself and at Kings Castle, rising above Paradise Lake. The former is the larger of the two is one of the most unique wilderness mountains to be found in the country. Composed of a long, sweeping slope of bright white marble, Marble Mountain is a striking, fascinating formation. Its northern side, however is a steep cliff that drops off sharply into the headwaters of the Elk Creek drainage. Sitting atop the eastern corner of this incredible formation is Black Marble Mountain, a roof pendant left over from the mountains formation. The Marble Mountains are drained by the North Fork of the Salmon River as well as several other notable creeks. The largest creek in the range is Wooley Creek, which is the biggest tributary of the Salmon River. The eastern section of the range is part of the Scott River drainage. Notable creeks including Shakleford, Kidder and Canyon Creeks all contribute significant amounts of water to the Scott River. The northern section of the Marbles is part of the Klamath River’s immediate watershed and is empties into the river by way of large creeks like Elk and Grider Creeks. Like other parts of the Klamath Mountains, there is an extensive network of trails that are reasonably well maintained. Weeklong backpacking trips are easily possible here. Unfortunately the Marble Mountains, especially the northern part, have experienced significant fire damage in the last few years. They remain beautiful and recovery has already commenced but hikers must anticipate snags and some trails in need of post-fire maintenance, especially in the more remote corners. Duzel Rock seen in the upper left. These two, small, ranges are in the far northeast corner of the Klamath Mountains. Neither climbs very high and has a strong high desert influence, especially along their lower flanks. The Little Scott Mountains’ southern boundary begins along the East Fork of the Scott River and Willow Creek. The latter is part of the Shasta River watershed. The northern boundary is where the small range meets the Scott Bar Mountains just west of Yreka. 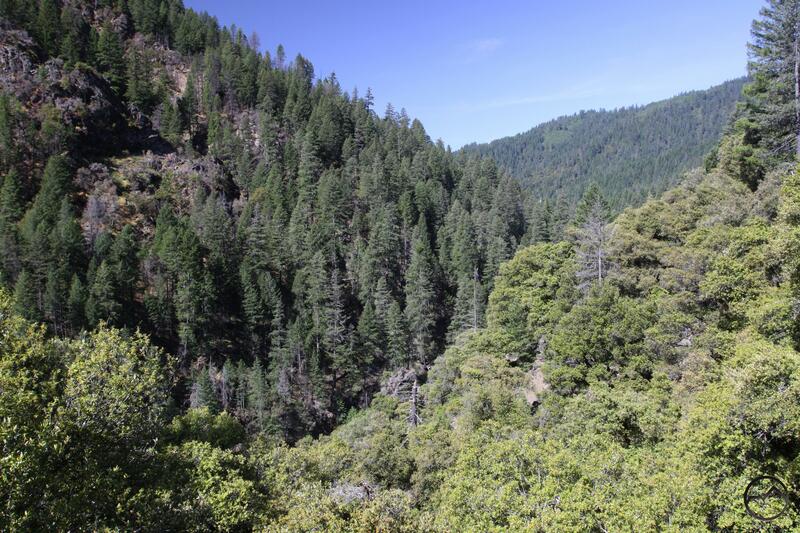 They form the divide between the Scott and Shasta Valleys. Though the Little Scott Mountains lack the rugged character of most of the Klamath Mountains, they do contain a couple notable features. First is Scarface Ridge and Antelope Mountain. These constitute the crest of the range. The other notable landmark is Duzel Rock. This massive rock protrusion is home to a Calfire lookout. The Scott Bar Mountains rise higher than the Little Scott Mountains. Consequently, they do have more forest cover than the Little Scott Mountains. These mountains form the divide between the Scott Klamath Rivers. Running east to west, they join with the Little Scott Mountains just west of Yreka. Neither of these mountain ranges is in anyway developed for recreation. The only destination of note is Greenhorn Park in Yreka. This attractive park is on the very eastern fringe of the Scott Bar Mountains and has a well-developed trail system as well as a lake, playgrounds and other recreational facilities. Lack of significant blocks of public land further impair recreational potential of these small mountain ranges. Devils Punchbowl in the Siskiyou Mountains. Forming the great northern bulwark of the Klamath Mountains, the Siskiyous form the great divide between the Klamath River and Rogue River watersheds. Forming a vast crescent, the Siskiyous stretch from Siskiyou Summit, where the Klamaths and Cascade Range meet, to the low hills near the confluence of the Klamath and Salmon Rivers. This long arc includes some magnificently rugged terrain and gives rise to several large creeks that feed into the Klamath River. The Illinois and Applegate Rivers, the two main tributaries of the Rogue River, also form on the northern slope of the Siskiyou Mountains. The range can roughly be divided into two sections. The most heavily used is the long east-west ridge that runs from Siskiyou Summit west toward Thompson Ridge. A significant portion of this half of the Siskiyous lies in Oregon. Mount Ashland, the highest peak in the Siskiyous is found here. The other part of the Siskiyous is almost entirely in California as it dips south along the Klamath River. This area is much more rugged with numerous large lakes and craggy peaks. It is crowned by epic Preston Peak, which is only slightly shorter than Mount Ashland but far more prominent and rugged. Two wilderness areas are found in the Siskiyous. 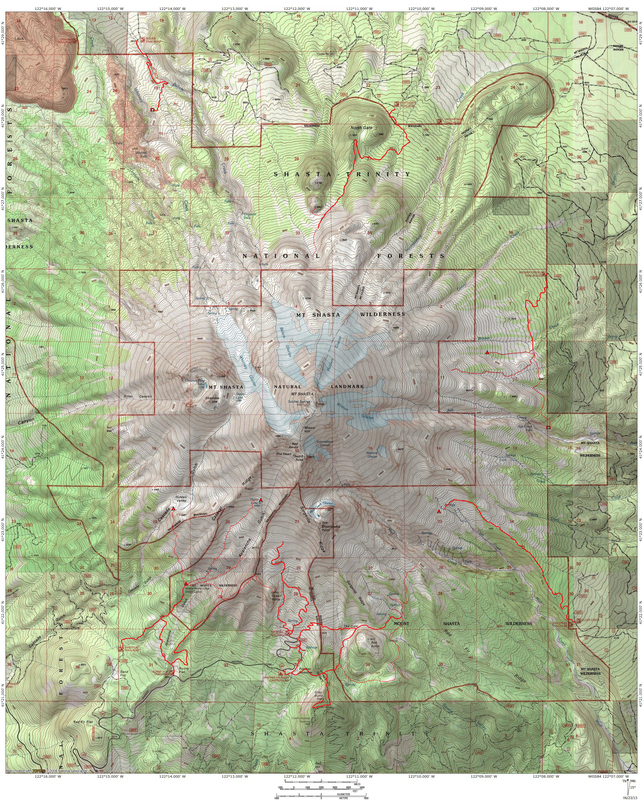 The Red Buttes Wilderness is the smaller of the two and receives somewhat heavier use due to its easy access from Oregon and relative proximity to population centers. Several small lakes are found in this wilderness, many of which form the headwaters of the Applegate River. The Red Buttes themselves are the centerpiece of the wilderness. Composed of bright red peridotite, they are classic Klamath Mountains peaks. In contrast to the diminutive size of the Red Buttes, the Siskiyou Wilderness is the third largest wildlands in the Klamath Mountains with over 170,000 acres. This vast land is not as tall as the other major subranges of the Klamath Mountains but it has extremely rugged, rocky terrain, several notable peaks and a number or large, deep lakes. Sinuous Clear Creek drains the interior of this exceptional wilderness. The somewhat arbitrary line that marks the border between California and Oregon also divides the Klamath Mountains. A significant chunk of the range lies north of the border in the Beaver State. Much of this is part of the Siskiyou Mountains. However, there are other areas that are noteworthy. In particular is the amorphous block of mountains that is centered on the Kalmiopsis Wilderness. These mountains were devastated by the 2004 Biscuit Fire but they remain beautiful and are well down the road to recovery already. These mountains exhibit typical Klamath Mountains geography. Nowhere it this more evident than around Vulcan Peak and small Vulcan Lake, where the red peridotite that is so common in the Klamaths is quite evident. However, geology only makes up half of the metrics by which the Klamaths are determined. Watersheds are also important and the fact that these mountains are drained by the Illinois and Chetco, the former of which feeds into the Rogue River, makes this area feel like a region apart from the main block of the Klamath Mountains. Even much of the Siskiyous, though part of the divide between the Rogue and the Klamath, feel like they are once removed from the Klamath Mountains as well. Perhaps in time they will receive their own treatment in this geography series.